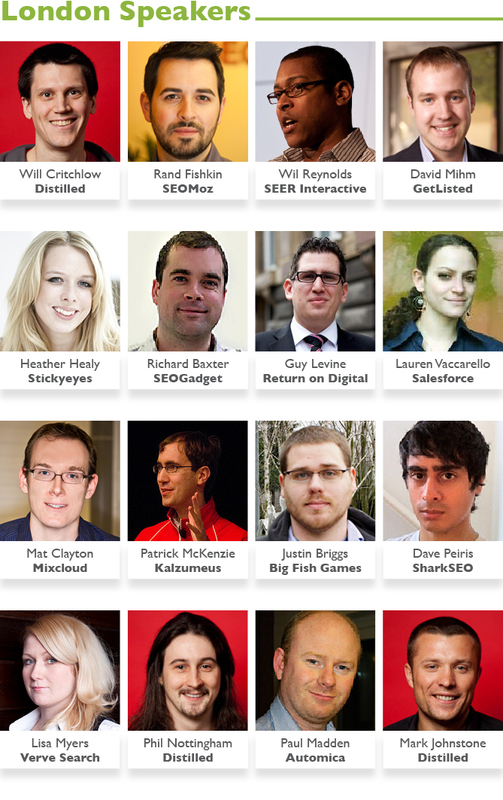 Speaker lineup revealed - who will be joining us for this year’s SearchLove? What can you expect at SearchLove 2012? This year's SearchLove is set to be our best yet, and you do not want to miss out on seeing this incredible line-up of speakers. The sessions are still being finalised and we will release the full schedule in the coming weeks! Early bird tickets are currently on sale, be sure to register your place now to take advantage of our best rates in London and Boston. Just a 5 minute walk from the conference centre. We have negotiated a discounted rate for our delegates of £153 on 28th/29th October and £183 on 27th/30th October (inclusive of VAT & breakfast for single occupancy) Simply call the hotel directly on +44 (0)871 977 0218 and quote ‘DIST281012B’ when making your booking. TIMINGS: Registration will open at 8am on Monday, the first session will commence at 9am, the last session will end at around 5.30pm. This will be followed by the exclusive party at 6.30pm. On Tuesday the first session will start at 9.30am and the last session will have ended by 6pm latest, and we're hoping to arrange some after-conference drinks. A shuttle bus from the hotel to the conference center will be provided during the two conference dates. We have negotiated a discounted rate of $169(plus tax) for our delegates staying on any date from 3rd - 6th November 2012. Simply call the reservations department on 617 277 1200 and quote ‘Distilled Delegates’ when making your booking. TIMINGS: Registration will open at 8am on Monday, the first session will commence at 9am, the last session will end at around 5.30pm. This will be followed by the exclusive party at 6.30pm. On Tuesday the first session will start at 9.30am and the last session will have ended by 6pm latest, followed by some casual drinks in a venue nearby. The full session agenda will be announced in a few weeks. Keep up to date with conference updates over on our events blog. We really hope to see many new and familiar faces at SearchLove 2012, if there's anything you need to know, just drop us a line - events@distilled.net.